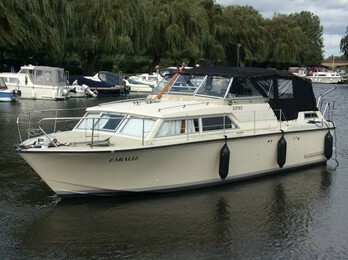 Coronet 31 aft cabin, "Zaraliz"
Coronet 31s are a spaciouse and well built Scandinavian classic aft cabin cruiser. This example is fitted with twin engines. Coronet 31's are a Scandinavian classic aft cabin cruiser.The design allows for 5 berths in 2 cabins. The quality of build is true Scandinavian with high quality timber interiors in mahogany. The semi displacement hull is usually powered by single petrol or diesel engines on shaft drives.